My sewing buddy Andrea sent me McCalls 5978 and I am so itching to start it. Thanks Again Andrea!!! - Left is a medium weight knit pink/grey argyle, but would like to do the sleeves in a solid pink or a solid grey knit..
- Left is a textured acrylic/nylon/spandex in lilac/brown/grey. Off to ponder some more. 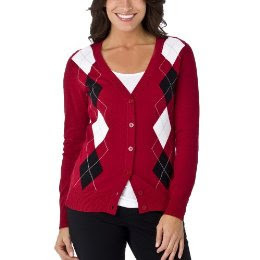 You have some great cardigan ideas! I just picked up that McCall's pattern yesterday. It does have a lot of possibilities. I did snoop shopping last night and found cardigans (twin sets) everywhere. Can't wait to see your results. LOL backyard cardigans, cute very cute. Love the prospects can't wait to see the FO's I know they will be awesome. I like textured cardigans personally. I can't wait to see what you do. I love cardigan, I am a gal who loves to layer her clothes, when you live in Texas it is imperative to have an assortment of cardigans because your constantly going from heat to A/C and you have to be able to slip it on and off with ease. I just got a new machine and I am itching to break it think I will have to check out this pattern. I have to make curtains for my daughters kitchen first but then something for me. I will be back later to peek at your finished cardigan.......!You do great work. Ooooohhhh I really like the cardigan with the buckles...gotta remember that one! Also try Pacific Trimmings or M&J for the bindings...though personally I like Daytona! I have plans to make several more cardigans this fall/winter too. I have the McCalls pattern and a vintage Stretch and Sew one I would like to try! I'm especially fond of argyle. So classy. I have the sammmeee pattern! I am so in love with cardigans! Can't wait to see it made up! You're better than me; I love all three examples and would be out shopping for more material ! Very nice. I love cardis.